Pioneer Holidays Delhi is the owner of the tour and the driver Vijay picked me up @ the hotel right on cue. He' s friendly and quite funny too. We drove to Delhi main train station and put me safely on the train. Be mindful that trains in India are not exactly Western Europe's standard. And Delhi is heaving with the mass. Upon arrival my tour guide Kashif Khan has already waited for me on the platform and off we went to the magical Taj. I think it was the highlight of this trip. Lunch @ the Marriott was nice but drinks not included. In the afternoon we covered the rest of the sites as listed in the itinerary in spite of the crawling space through Agra's traffic. Kashif is wonderful and funny as well and at the end of the day he put me back safely on the train to Delhi where Vijay was already waiting for me on the platform and then drove me back to my hotel.Be warned : Do not under any circumstances buy anything from the marble work shops nor the jewellery store in Agra. Just went along with the charade, but decline firmly and politely. Don't be afraid in being assertive. Everything with pioneer holidays went smooth and quick. I booked the tour to visit Taj Mahal for the first time and was happy to come across them, the company responded on time and I got my tickets for the train. Once in Agra the service quality was amazing, the guide welcomed us at the station with flowers necklace and gave us a memorable tour of Agra city. 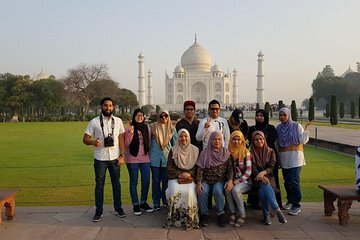 The best point was when we were at the roof of a hotel and got a chance to drink some beers and also see the taj at my background. I would surely recommend vicky by guide and chand my driver for the life time experience. We had a great experience with Pioneer Holiday, booked through Viator. They were very professional and followed up regularly. At the last minute my daughter fell ill and we had to cancel our 1 day trip to Agra from Delhi by superfast train, which was to include the Taj Mahal. They gladly arranged another tour around Delhi for me to do alone, at no extra charge. Their courteous and helpful customer service, their flexibility and understanding of our situation, and their willingness to change my arrangement, all lead me to say I would certainly recommend them!